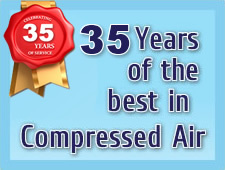 Recover excess heat from your compressed air system - efficiently and effectively with AIP. Compressed air systems account for approx. 10% of all electricity used in industry, with 95% of this energy converted to heat and then wasted through heat being dispersed via the motor and cooling system. We can help to recover this loss by re-directing hot oil to a high efficiency oil to water heat exchanger. This method allows the heat to be transferred to water which raises the temperature to a degree that will allow a variety of applications such as heating, production process or washing. As a result you will save money, energy and reduce your carbon footprint at the same time. Our specialist installation teams can fit a heat exchanger on site, or they can be provided in kit form for self-installation. Thank you for completing our form requesting more information about heat exchanger efficiency. We will be in touch to discuss your requirements shortly.